The ETi 75watt 5500 lumen LED linear flush mount fixture offers exceptional performance for precision lighting applications, while reducing energy and maintenance costs when compared with conven- tional light sources. 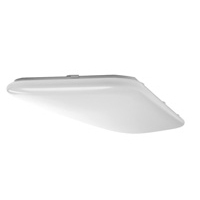 Lasting over 5 times longer, these flush mount fixtures are high quality replace- ments for fluorescent flush mount fixtures and avail- able in 4000K. They are UL listed for use in damp and dry locations. Warranty 5 years. Suitable for in- stallations from – 4° F to 113° F.
Applications for 1.5’x4′ LED Reva Series Light: The 1.5’x4′ Linear Flushmount LED lamp is designed to be used anywhere a standard fluorescent fixture is used. Typically in bedrooms, interior hallways, kitchens, living rooms, and recreational rooms. Other applications apply in commercial, office, retail, restaurant, schools, hospitals, multi family, and hotel/motel locations.